In the past, most activism has followed the following path. Demonstration on Immigration Reform will be held and that is the only issue referred to. Earth Day is about the environment and that is the only issue discussed on that day. May Day is about Labor and Immigration (due to the obvious connection with labor). This year, a call is going out to have all issues relating to people, planet and peace connect over 10 days beginning with Earth Day and ending (?) with May Day. The reason I put a question mark after ending, is that we hope that this will really be just the beginning of a worldwide movement of making connections. The fight for a minimum wage in order for people to have the basic necessities of life is being blocked by the desire for more and more profit. Labor is being cut, while the average CEO is making 273 times the average pay of their employees. (Washington Post, June 26, 2013). The social safety net is being dramatically unravelled, while the call for tax cuts for the wealthiest is often heard. Individual groups cannot really make the impact that is needed. Combined efforts can begin to shape a new future in which everyone has what they need and the earth and all that dwells upon it is secure. A new world is possible, if only we act. 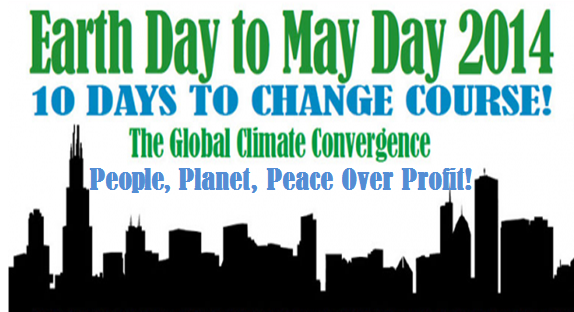 To find out about events happening in your area, please go to http://globalclimateconvergence.org .